SPW017716 SCOTLAND (1927). 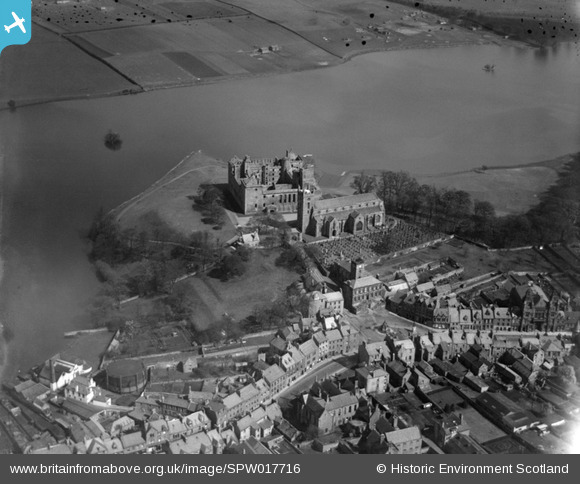 Linlithgow Palace, St Michael's Church and Loch. An oblique aerial photograph taken facing north. Title [SPW017716] Linlithgow Palace, St Michael's Church and Loch. An oblique aerial photograph taken facing north. The Cunzie Neuk (cosy corner) which was a popular inn before it was destroyed in the 1960s act of council vandalism. Smallholdings along the "back of the loch" were razed to make way for the building of the M9 in the late 1960s. The Victoria Hall, used for various functions, including a cinema. The twin conical towers were removed when they became unstable as the building settled on the sand which underlies much of the town. The Drill Hall, used for various activities including the training of the local harriers. Linlithgow police station,the small cell windows are clearly visible. The Sheriff Court, a relic of the time when Linlithgow was the county town of West Lothian (formerly Linlithgowshire). The Auld Hole in the Wa', one of the oldest pubs on the High Street. It takes its name from a previous pub on the site which served its customers literally through a hole in the wall. The Water Yett. A lane leading from the Cross to the Loch. The present "Water Yett" is several hundred metres to the west, leading from the High Street to the Loch. The transfer of the name raised hackles amongst some Linlithgow natives. The Spanish Ambassador's house which had survived from at least the 16th century, didn't survive the short-sighted urban demolition of the 1960s. St. Michael's church now has an aluminium crown topping the tower. The crown was designed by Sir Basil Spence, the famous Scottish architect. The core of the structure is laminated wood. The aluminium cladding was originally anodised in a gold pigment but this has weathered, leaving the crown silver. 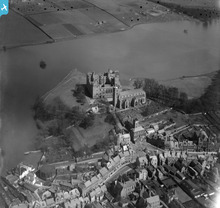 The Rickle and Cormorant Island in Linlithgow Loch are two artificial islands or Crannogs.